Home › Flooring › How to Install Bamboo Baseboard and Shoe Molding. If you’re looking to install eco-friendly bamboo flooring in your home or workplace, you’ll probably come across frequent references to baseboard and shoe molding (or it’s close cousin, quarter round). These products are essential for creating a perfectly finished look to your floors. We’ve put together a list of answers to some frequently asked questions about installing baseboard, shoe molding and quarter round when wrapping up your flooring installation. 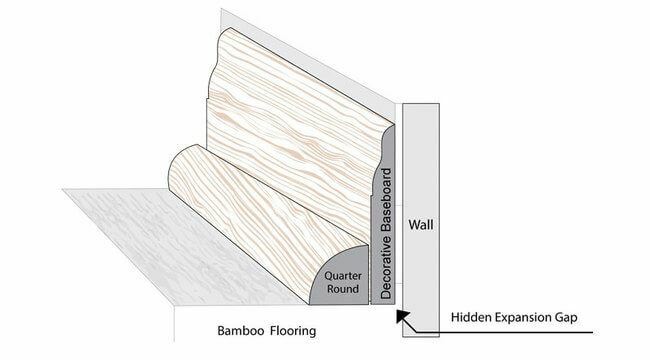 Why Do I Need Baseboard and Shoe Molding For My Bamboo Floors? Shoe molding and baseboard moldings are more than just a pretty face. It’s important to leave an expansion gap of at least ¼ – ½ inch around the perimeter of your floor when installing hardwood flooring, because all wood expands and contracts with the seasons. This includes around all solid fixtures such as kitchen islands and wall columns, as well as door frames. The gap allows the flooring to expand and contract with different temperatures and humidity levels. Baseboards (aka wall base) are decorative accessories that are installed around the perimeter of a room to hide the expansion gaps, and they’re often paired with quarter round or shoe molding to ensure those gaps are completely hidden. If you’re installing bamboo flooring in a newly built property then baseboards may be all that you need to fully cover the gap. For renovation projects, you may find that the baseboard is already installed prior to fitting the floor. In these cases, the expansion gap will sometimes be between the baseboard and the edge of the flooring. Shoe molding (aka quarter round) is used to hide this gap in the most discreet and visually pleasing way possible. What Do I Attach the Shoe Molding and Baseboard To? 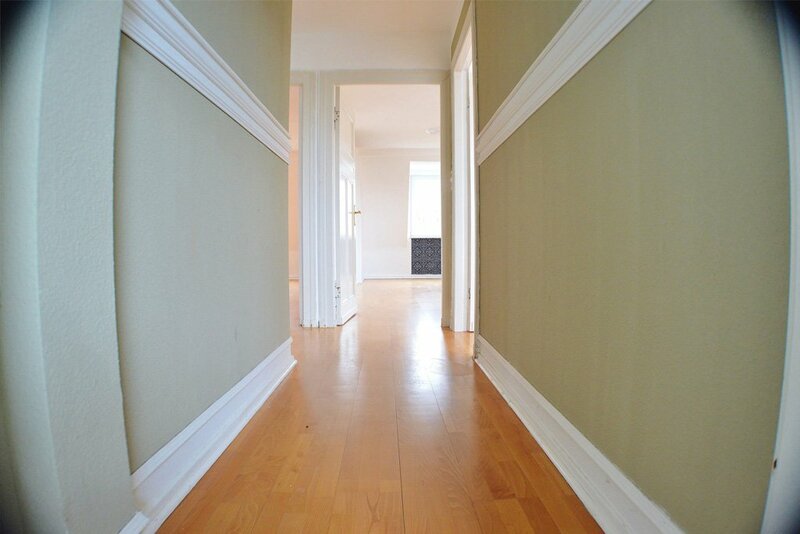 Always affix the baseboard to the wall, and the shoe molding to the baseboard. Neither should be attached to the floors. If you attach them to the floors they’ll stop the floor from being able to expand and contract – defeating the whole purpose of leaving an expansion gap to begin with. If you make the mistake of attaching shoe molding to the floor you may even find it comes away from the baseboards as the floor tries to contract, leaving a gap between the floor and the wall. Remember, bamboo and hardwood floors need space to breath, as they change shapes slightly during seasonal cycles. Should I Nail or Glue Them? Deciding whether to glue or nail your moldings will come down to your personal preference, however we tend to prefer nailing for various reasons. One of the key benefits of nailing your is that it can be easily removed again if you need to carry out work on the walls or floor. It’s exceptionally difficult to remove molding that’s been stuck on with glue unless you’ve used glue specifically designed to allow for disassembly. After all, the whole point of glue is that, well…. it sticks! We suggest avoiding using glue on any areas that you may need to service or refresh in the future. If you do, you risk having to destroy the baseboard, wall and flooring if that molding ever needs to be removed. A top benefit of nailing baseboard and moldings is that the attachment is complete as soon as the nails go in. With glue, you may have to wait hours for it to fully dry depending on the type of adhesive you choose. If you leave the walls alone before the glue is sufficiently set, you risk the boards slipping out of place and the glue drying them ‘wrong’ on the walls. This can be a nightmare to put right and you risk damaging your walls when trying to remove the incorrectly placed moldings. If you nail your baseboard in the wrong place it’s fairly easy to remove the nails and re-position it. Gluing gives a greater risk of mistakes which are often harder to correct. If you spill the glue or add too much and cause it to run or seep out between the boards then this is very difficult to put right. You may have trouble getting glue to stick effectively if you’ve painted your moldings to better suit the color scheme of your room. Nails don’t have that problem – they just punch straight in! Many people believe that gluing is a better method for attaching baseboard as it doesn’t affect the design of the molding as the adhesive can’t be seen from the front. If you’re also thinking along those lines, it may help you to know that micro thin nails are hardly visible either, especially if you caulk or paint them afterwards. There are also nails you can purchase that have white heads, which makes them less visible. Installing bamboo or eucalyptus strand trim pieces with a nail gun can be more difficult than trim pieces made of other materials. If you’re having issues with bending nails, pre-drill a pilot hold using a drill bit that’s slightly smaller than the nails. Alternatively, give up the drill and nail your baseboard the easy way! We suggest using a micro-pin nail gun such as the Bostitch Porter Cable 23 GA gun with a 1″ long micro thin nail. These can be rented from the big box stores or purchased directly from Bostitch or online at websites such as Amazon. Nail guns make installing baseboard very quick and simple – you’ll have the job finished in no time! I’ve Decided To Glue. Which Glue Do I Use? If you decide to glue your baseboard and molding we recommend Gorilla Glue, Titebond molding glue or Liquid Nails. Gorilla Glue will set pretty quickly, which will make your installation a bit less painless. Otherwise look for urethane based glue for optimum adhesion and to avoid damaging your floors. Do not get glue on the surface of the floor as it may damage your finish irreparably if it dries. At Ambient Bamboo Floors we’re proud to stock the web’s largest selection of bamboo flooring & moldings. Our color matching service allows you to mail us a 5 inch sample of your floor so that we can recommend a product that matches. ‹ Nailing Down Bamboo Flooring? A Simple Guide.